Guru Nanak Jayanti is also known as Guru Nanak Gurpurab and also as Guru Nanak's Prakash Utsav. The day marks the birth of the first Sikh Guru, Guru Nanak and is one of the holiest festivals for the followers of Sikhism. The festival needs no formal introduction. Guru Nanak was born at the time when the Bhakti movement was at its peak and it was said that a messenger would descend from the heavens to provide relief to the many souls who would sink in the vast ocean of worldliness. 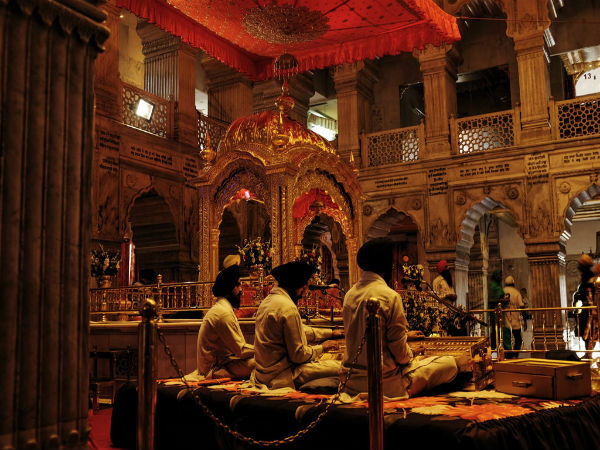 As Guru Nanak Jayanti is being celebrated today, lets take a short pilgrimage to various gurudwaras that are associated closely with Guru Nanak himself and other Sikh Gurus and chant Waheguru ! The Golden Temple or Harmandir Sahib is considered as the holiest place of worship for the followers of Sikhism. The structure is built at a level lower than the ground level, to teach the values of egalitarianism and humility to every visitor. The holy shrine is open to all people, irrespective of their caste, creed, religion, etc. The shrine stands out for its usage of gold in the architecture and the mammoth community kitchen or langar which feeds thousands on a daily basis. Originally a bungalow which belonged to Raja Jai Singh, a local ruler in the 17th century, it was named Jaisinghpura Palace. It was located in the historical neighbourhood which was demolished to make way for the shopping district of Connaught Place. The Gurudwara is associated with the 8th Sikh Guru, Har Krishan who stayed here in the year 1664, during which there was an outbreak of cholera and smallpox epidemic. Guru Har Krishan came to the aid of the affected and used the fresh water from the well at the bungalow. Very soon he too fell victim to the illness and eventually died in the year 1664, after which a small tank was constructed over the well by Raja Jai Singh. Its water is now considered holy and revered as having healing properties, which is why it is taken home by Sikhs across the globe. Located at a distance of 40 km from Leh, on the Leh-Kargil road, the Gurudwara Pathar Sahib was constructed in the year 1517. As per legends, a demon used to give trouble to the people living in the area. When people prayed for help, Guru Nanak is said to have reached the place. The demon made an attempt to kill Guru Nanak while he was meditating by throwing a huge boulder against him, but the boulder melted as soon as it touched Guru Nanak and left an imprint which got engraved on the boulder which further angered the demon who kicked the boulder to kill Guru Nanak. But he failed again and asked for forgiveness from the Saint, who is fondly called Nanak Lama. Located at a height of over 15,000 ft above sea level in the Himalayan ranges is the Hemkund Sahib which is visited by a large number of devotees from across the globe during the summer months, as the place remains out of reach during the rest of the year due to heavy snowfall. As per the Bachitra Natak, which is the autobiography of Guru Gobind Singh, the place was the site which housed seven snow peaks where he meditated in his previous birth. Guru Nanak during his visit to Manikaran, asked his disciple to collect alms for the langar from the local villagers. He came back with mostly wheat flour for cooking rotis; however, there was no place to start a fire for cooking. As a solution to this Guru Nanak asked him to lift a boulder and when he did so, a hot spring arose from the ground and when he placed the raw rotis, they sank without leaving behind a trace and re-emerged cooked. To commemorate this happening a Gurudwara was built at the spot and devotees take a dip in the hot spring before offering their prayers here.